Way to go Christina! Doing the Valley proud again!!! Pitt Meadows, B.C. 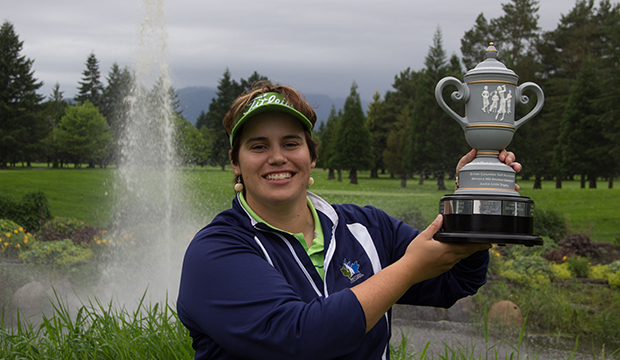 (BRITISH COLUMBIA GOLF)-- Christina Proteau captured the 2013 Women's Mid-Amateur title at the par-74, 6220 yard Pitt Meadows Golf Club after a blistering round of four-under-par 70. In the final round of the Mid-Amateur Championship, Proteau put togethe what would be a tournament-tying low 70 (broken 5 minutes following its posting), allowing her to surpass 23 other competitors on way to victory. "Today was a very good round especially given the lack of momentum coming into it. I wasn't feeling too super after yesterday's round" stated the jubilant Proteau after hearing her named called as the champion. Proteau notched her third Women's Mid-Amateur title in five years and could have been victorious in last years event if it weren't for losing in a playoff to Kyla Inaba. "I was thinking about last year a little bit today and it did motivate me," stated Proteau. "For me that did sting and that sting stayed with me a little while. It was motivation to not feel like that again." "Jackie is a good friend of mine and started off as a mentor to me when I was younger at my first BC [Women's] Amateur," mentioned Proteau. "It is an honour. Jackie is a Hall of Famer and a first class competitor so to win something with her name on it is awesome." 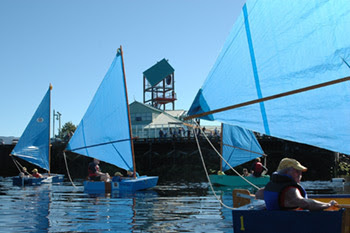 The 10th Annual Puddleduck World Championships go tomorrow in the Harbour. Racing goes from 10am to 3pm tomorrow, with the boats racing from the Breakwater to the Lighthouse and back. Should be fun to watch, with the weather improving throughout the day, at least according to Environment Canada! The Bulldogs have released their Exhibition Schedule. They will get the guys used to the BCHL grind early, playing three-in-three right off the hop. They will play a total of five pre-season games, starting Friday, August 23rd when they travel to Chemanius to take on the Cowichan Valley Capitals. They head down to Victoria the next night to visit the Grizzlies, before returning home to host the Grizzlies at 2pm on Sunday, August 25th. They finish the preseason with a home-and-home set with the Clippers, beginning Friday, August 30th in Nanaimo and finishing the following night at the Alberni Valley Multiplex. Buy tickets for both games and SAVE! Ticket prices for the two game packages are: $15 for Adults, $10 for Students/Seniors, and $7 for Children. Single game tickets can also be purchased at the price of: $10 for Adults, $7 for Students/Seniors, and $5 for Children. Tickets for the exhibition games will be general seating, so fans can test out different seats and find their favourite section! 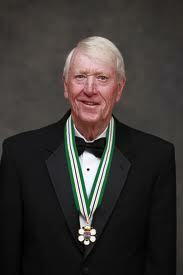 Former CJAV Broadcaster, voice of the Athletics, voice of the Canucks, Hockey Hall of Famer, B.C Hockey Hall of Famer, a member of the BC Sports Hall of Fame, Order of BC recipient, and last but not least, true gentleman - Jim Robson - will join me on the 93.3 The Peak FM Morning Show this morning just after 8:10am. 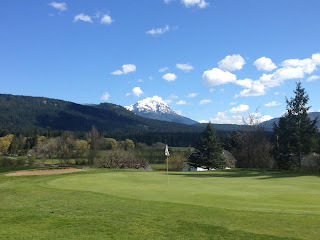 We will talk about the upcoming Alberni Valley Charity Golf Classic July 5th and 6th and of course about his early career memories from Port Alberni. It's always a pleasure having the opportunity to talk to Jim, don't miss it! 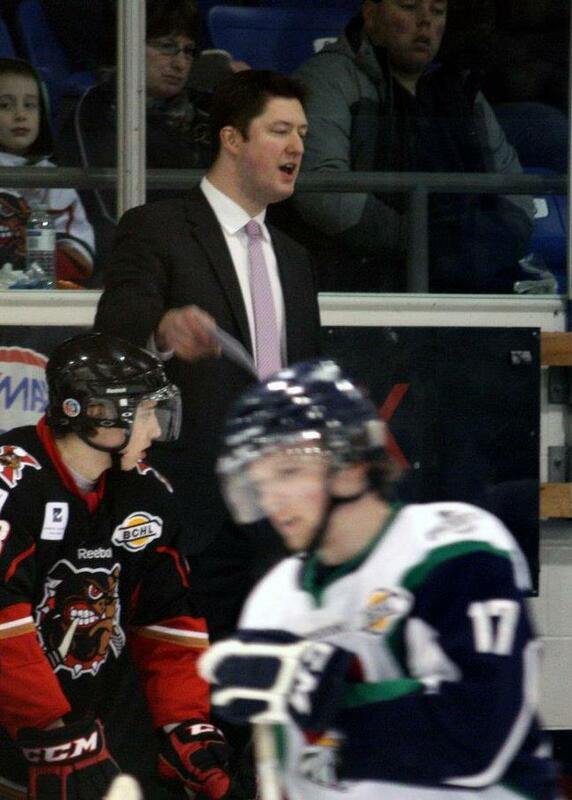 Big congrats to Bulldogs Assistant Coach/Director of Hockey Operations, who was named yesterday to the Team Pacific Coaching Staff for the upcoming U17 World Hockey Championship. Hayduk will be the team's Video Coach. Congrats Adam! Of course the Bulldogs open September 7th and 8th at the Showcase. Now we know the Home Opener is Friday, September 13th (how fitting) as they host the Nanaimo Clippers. WOW, what finish last night as the Hawks won the Cup with the latest regulation-time winning goal in Stanley Cup clinching-history! I love this version as it also has the French broadcast at the end! Great story here, as a couple 20 year old players who came to the Dogs looking to further their education and hockey careers are now off to the NCAA level next year. 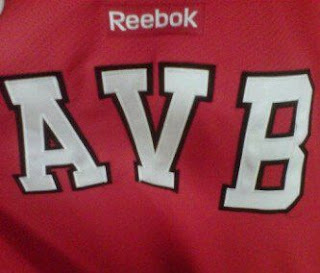 Port Alberni, BC – Following the conclusion of the most successful playoff run in Alberni Valley Bulldogs team history, the coaches and educational advisor Tom McEvay continue their hard work to promote players to the next level. As a result, we would like to congratulate Chase Paylor and Jay Deo. Both players recently committed to NCAA Division III programs for 2013/14. Shortly after the season ended, Bulldog’s forward Chase Paylor committed to play for the University of St. Thomas Tommies starting next season. The 21-year-old Calgary native was acquired just before the trade deadline and played 19 regular season games. He made an immediate impact by adding 13 points in the regular season, including one power play goal and two game-winning goals. The 6-foot, 175-pound Paylor became the seventh Bulldog to commit to school for next season. The University of St. Thomas in St. Paul, Minne competes in the MIAC conference. Also announced today: Team MVP Jay Deo has committed to the University of Wisconsin-Eau Claire for 2013/14. Deo was acquired in the off-season and immediately became a fan favourite through his outstanding and exciting play each and every night. Deo and Rebagliati soon became a very strong tandem and won many games for the Bulldogs this season. 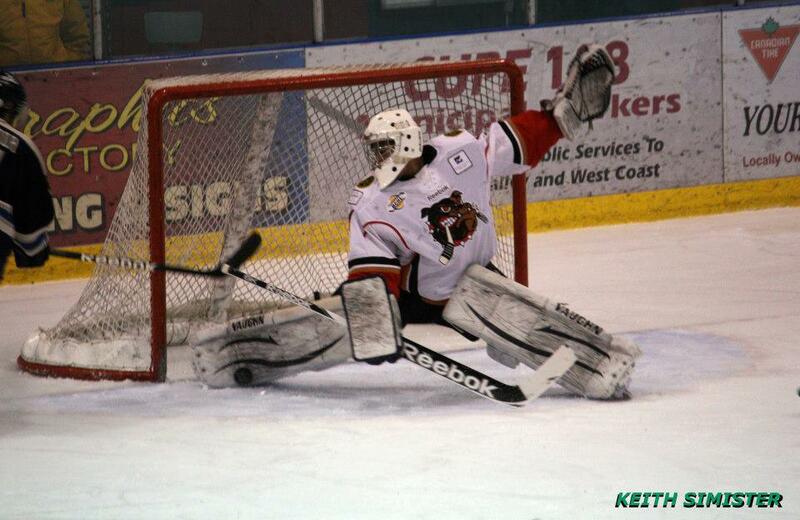 Deo appeared in 43 regular season games for the Bulldogs and posted a .914 save percentage. However, it’s what he did in the playoffs that will be remembered for a long time. Deo backstopped the team to the most successful playoff run in team history, playing in all 14 playoff games en route to an amazing 2.37 GAA and a save percentage of .935. “We are extremely proud of both Chase and Jay and what they contributed to the organization this season,” said Bulldogs Head Coach and GM Kevin Willison. “They worked hard both on and off the ice to realize their goals and dreams of playing college hockey at respected programs next season,” concluded Willison. The Alberni Valley Bulldogs family would like to thank Chase and Jay for an exciting season and wish them both continued success in college and in all their future endeavours. Rob Shick on THE PEAK this Morning! Former NHL Referee and Port Alberni Native Rob Shick will be on 93.3 The Peak FM just after 8:10 this morning along with Bruce MacDonald, talking about the upcoming Alberni Valley Charity Golf Classic, July 5th and 6th. Don't miss it! Speaking of "don't miss it" , check out the below video from Puck Daddy of how viewers in Austin, Texas saw the OT winner last night...or actually didn't see it. Whoops. Sounds like once again some solid off season additions to the team, joining already-added Justin Georgeson and of course the possible list of returnees! Apologies I'm getting this on the blog late...pretty busy week away for me last week!! 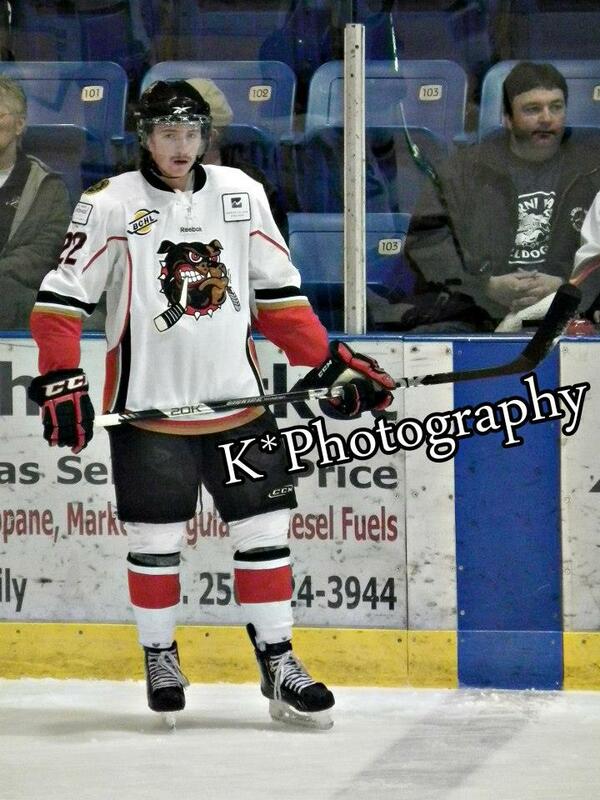 Port Alberni, BC – The Alberni Valley Bulldogs announce today that they have acquired the rights to 1994-born forward Shane O’Brien from the Stratford Cullitons of the Greater Ontario Junior Hockey League. Even with an injury that O’Brien sustained at the spring camp, that didn’t slow down his compete level and goal production. That showed the organization that he is a player that the fans in the Alberni Valley will be proud to call their own. O’Brien put up 47 points in 48 games in the 2012/13 season and come from an organization that has produced many successful Junior A and professional players, including Penticton Vee’s all-rookie team member Brad McClure, Nelson Emerson, Boyd Devereaux, Ed Olczyk, Louie DeBrusk, Bryan Smolinski, and Chris Pronger just to name a few. The Alberni Valley Bulldogs also take this opportunity to announce two other players that were commited to out of the 2013 spring identification camps. Victoria-born forward Josh Adkins played this past season with the Peninsula Panthers of the Vancouver Island Junior Hockey League. Adkins, born in 1995, put up 11 goals and 32 assists in 46 games with the Panthers and came highly recommended by his former coaches. He also contributed with a game-winning goal against the Powell River Kings in Round 1 of these year’s playoffs. 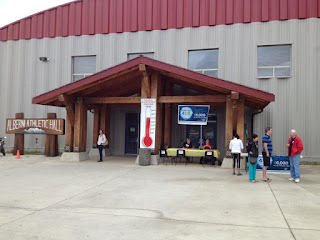 Adkins impressed the coaches and evaluators at the Port Alberni spring identification camp and seemed to make an impact everytime he was on the ice. “I went into the camp pretty hopeful but I was also nervous because there were many talented players at the camp,” said one of the newest Bulldogs Josh Adkins. “When I was asked to sign at the end of camp I was really relieved because it has been my goal to play in the BCHL for a couple years now. I’m looking forward to playing in front of the best fans in the league and also being a part of such a respected organization and community,” concluded Adkins. 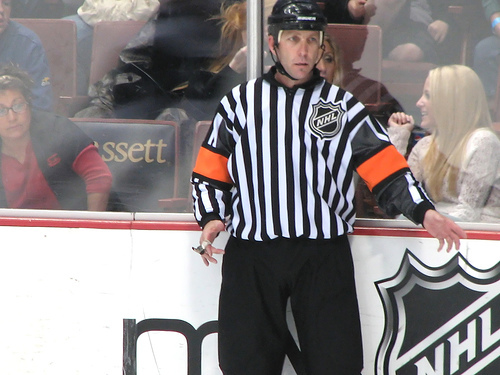 Ostoforoff is a stay-at-home defenseman that also plays with a mean-streak. Ostoforoff’s strong skating abilities and compete level makes him a very effective shut-down defenseman. The Alberni Valley Bulldogs would like to welcome Shane, Josh, and Riley to the Bulldogs family. More exciting player announcements are soon to follow. The public’s first chance to meet these three players will be at the 2nd annual Alberni Valley Bulldogs season kick-off golf tournament held on Saturday, August 17th at the Alberni Golf Club. 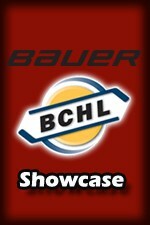 Please check the Alberni Valley Bulldogs website later this week for more details. From bchl.ca ....after two games in the small rink last year, it's two in the "big rink" for the Dogs this year at the Showcase. Drop the puck already! 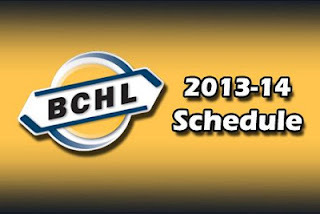 The BCHL has finalized the schedule for September's Bauer BCHL Showcase, being hosted for the second consecutive year at Chilliwack's Prospera Centre. 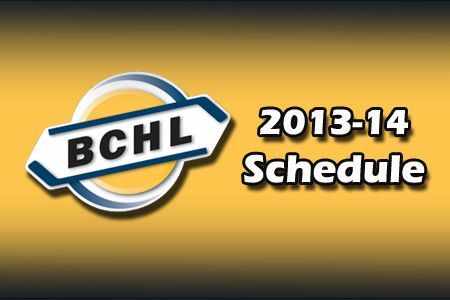 The Showcase schedule was an item on the recent BCHL annual general meeting last week in Richmond. Each club will play two games that count towards the regular season standings. Last year at the inaugural event, there were close to 200 scouts from the college and professional ranks taking in the action. The 2013 event runs from Friday, Sept. 6 to Sunday, Sept. 8. Games will be split between Prospera Centre's main and secondary sheets of ice. 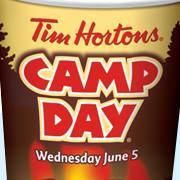 Tim Horton's Camp Day today, ADSS Pancake Breakfast tomorrow! Whatever you do, make sure you find a couple of minutes to rip to Timmy's to help out! 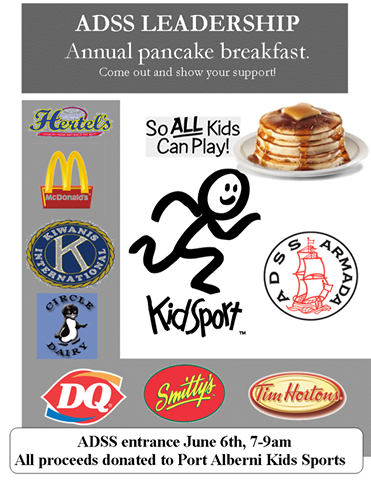 The ADSS Leadership breakfast is tomorrow! Jolie will be phoning in with updates for both events, so keep listening to THE PEAK! 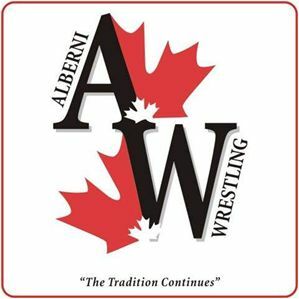 Starting with great news from Alberni Wrestling...well done gents! Two local wrestlers travelled to Vancouver this past weekend to compete for a birth on Team BC and be eligible to wrestle in the Canada Games in Quebec this August. Nolan Badovinac (grade 10, 76kg’s) made the team and Jonathon Spencer (grade 12, 69kg’s) was named as an alternate to the team. Nolan Badovinac after winning the Cadet National Championships a couple of months ago found himself competing against wrestlers that were a year or two older. In the Finals he was up against a grade 12 wrestler, Suhkman Sidhu from Abby Traditional School. After winning the First match in a best of three series, Badovinac had to come from behind to win the second match and claim the birth on the BC team. Jonathon Spencer made it to the finals after beating Eric Bauer from St Thomas Moore. In the final, Spencer was in tough and lost to Justin Gill from Rick Hansen Secondary in a best of 3 winner take all. Spencer then was named as the Alternate to the BC team in case Gill is not able to compete. Nolan Badovinac now has a busy training schedule prior to the games. He will likely travel to Vancouver on weekends and train with the Provincial Team. There will be three training camps in the USA with team BC starting in June and going through July. There will be a staging camp in Vancouver in late July at SFU prior to leaving for the Games in early august in Quebec. This is lots of fun, all at The John Paul II Catholic School/Mini Miracles Daycare, 4006 8th Ave! Are you ready to take a trip around the world in just 3 hours?! 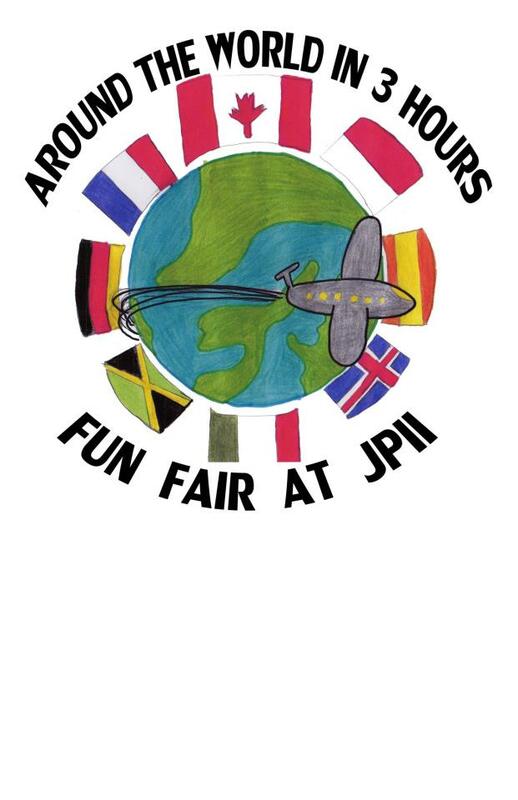 JPII Catholic School is gearing up for our second annual FUN FAIR!!! 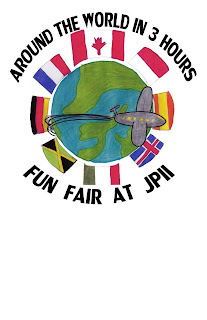 Last year's fair was a ton of fun and a great success, and we are very excited to be putting on another event this year. - Go for a pony ride!!! - And much, MUCH more!!! Sunday June 2 Men’s Club Results. Closest to the pin # 2 Darrell Van Os, #4 Sammy Parhar, #13 Al Wright #17 Steve Acland and for his second shot on # 11 it was Cory Nielson. The hidden hole was #16, it will be a carry over as there was no winner. Net skins winners were. Steve Acland, Darrell Van Os, Sammy Parhar and Mark Anderson. Usually every two weeks, Men's Night goes again this Thursday..call 250-723-5422 to get registered. Always a great time with a great meal and great prizes! Get to the Alberni Athletic Hall ASAP if you are reading this for Van Isle Ford's Drive 4UR Community. The goal is to raise the needed funds to raise people to the next level of the building - yes, all monies raised to in the Athletic Hall Elevator Fund! It's pretty simple - go for a 5 minute test drive and Van Isle Ford will donate $20.00 to the cause. They WILL NOT try to sell you a vehicle. They WILL NOT call you, email you, fax you, or snail mail you. They just want you to come for a 5 minute test drive so they can donate the 20 bucks to the Athletic Hall! The Peak has sweetened the pot by throwing in a prize for everyone that comes and takes a test drive - come down here today and enter your name to win Golf for Two including power cart and a dinner credit from the Alberni Golf Club! I'm here live until 2pm today, the event goes until 3pm!